It’s been a busy year thus far, but in a productive and positive way. I’m a big resolutions person: I love the hopeful anticipation and optimism of resolutions. They’re like little presents to yourself, wishes and goals for ways in which you can improve yourself and the world around you in the hopes of affecting positive change. One of my resolutions for this year is to more effectively maintain this space by posting at least bi-weekly. I know that it takes a conscious effort to consistently do something before it becomes habitual, and thus I have to be a bit more conscientious in implementing my resolutions so that what in theory seems like a good idea can, indeed, become practice. I hope that all of you are also enjoying a wonderful start to 2009. If you, too, have been a bit lax on your resolutions, just pat yourself on the back for having too much fun in the new year to focus on resolutions and resolve to do better from here on out. After all … tomorrow is another day. I had to give some consideration to what would be my first post of the new year. I have several on deck, but should I start with something sweet? Something savory? Something suited to cold nights? Finally I thought, why choose at all? I want it all, and I want it now. 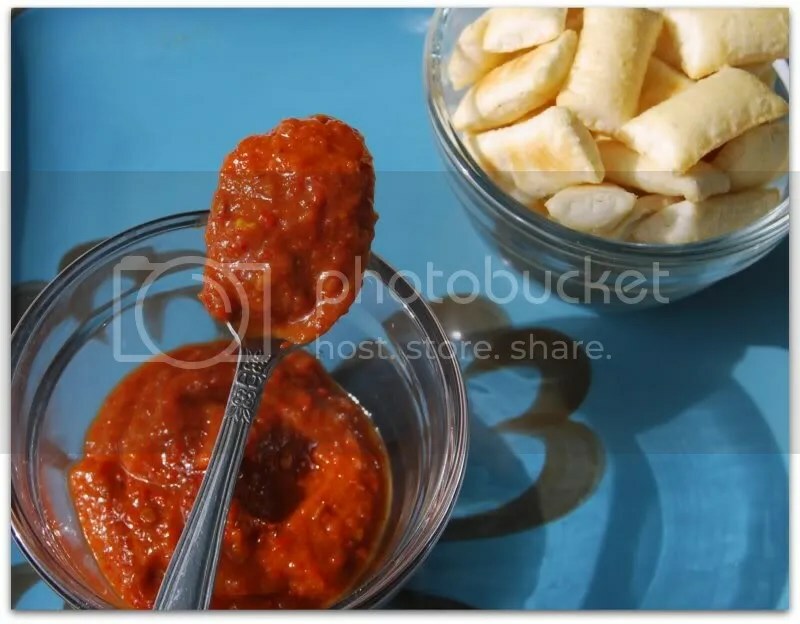 So here it is: something sweet, something savory, something to warm your toes on those cold winter nights, something to give a kick to your tropical soiree ….. it’s homemade tropical hot sauce. Recently I had an abundance of poblano peppers in my garden that I decided were destined to be more than just a supporting player in a dish. I decided to make them the main attraction by making some hot sauce from scratch. This was my first experience making hot sauce and I was surprised by how easy it was. After searching the internet for some inspiration and good ol’ fashioned how-to, I found this recipe that I used as my starting point. In the end, I decided not to strain my sauce. This made for a nice, thick sauce that I was able to use both on food and as a dip. I especially like it as a dip – put it in a small bowl surrounded by bite size crackers and veggies and serve it to a crowd (just be sure to set aside some for yourself or you will be completely out of luck!) Just be sure to plan in advance – this sauce gets better with age, so allow it to sit in the refrigerator for at least one week for the best flavor. It was only in recent years that I developed a tasty for spicy foods. I do, however, still register on the wimpier end of the heat spectrum – at Thai and Indian restaurants I opt for the “mild plus” heat option. 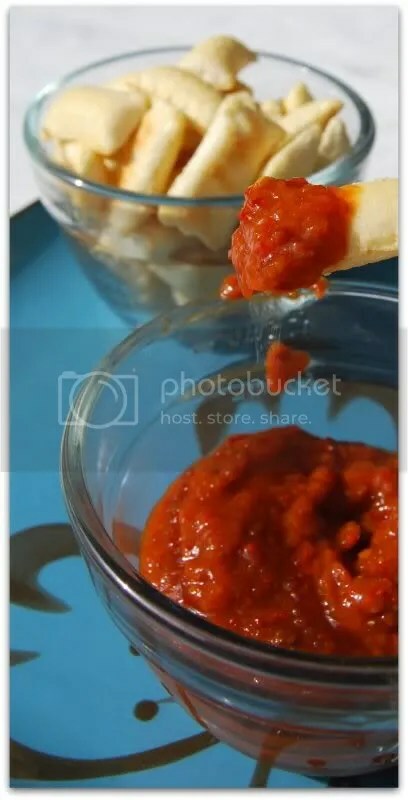 This sauce will please palettes at both ends of the spectrum: my heat lovin’ partner in crime raved about this sauce but it was mellow enough that I thoroughly enjoyed the flavor of the sauce straight up on crackers and veggies. What more can you ask for in a hot sauce? Combine all ingredients except vinegar in a food processor and puree until smooth. Pour into a pot and whisk in the vinegar until well combined. Cook on slow simmer for one hour. Run through a straining bag or food mill for a more traditional hot sauce, or leave as is for thicker sauce/dip. Refrigerate for at least one week to allow the flavor to develop. Mmm mango hot sauce! Sounds amazing! Oooohhh! That looks sweeet! I love the idea of hot & sweet. I need to try to grow some peppers on my windowsill this summer. I love that you got the Crewel book! Have you started anything yet? I’m jealous of your garden, right now my kitchen herb garden is holding on to dear life (long nights and cold windows). I love hot sauce that isn’t too spicy, I like to be able to taste all the flavors through the heat. 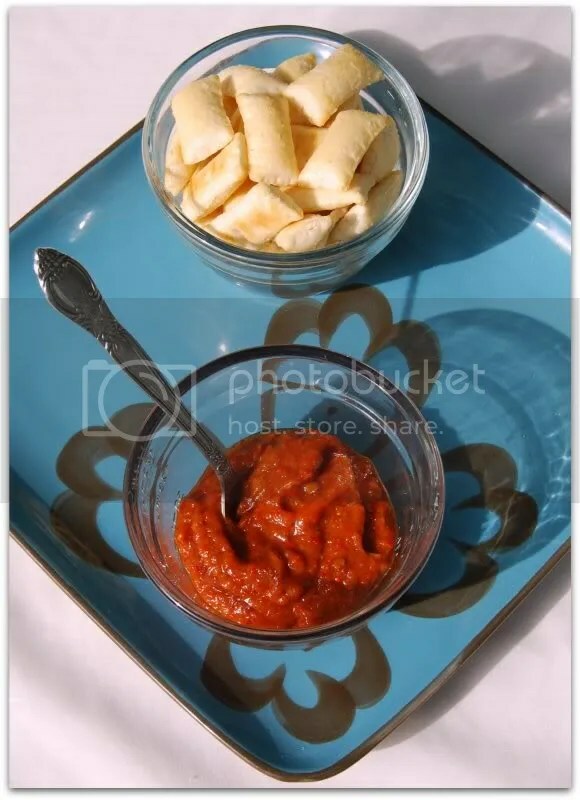 Banana mango hot sauce…sounds deliciously tropical! Oh I like to sound of this recipe. It’s so Caribbean in flavor and ingredients. Thanks, I’ll definitely try this only I’ll sub the white vinegar for apple cider vinegar. I love the new year and resolutions, too. And yay, if you keep up with your resolution about your blog, love to read more. The hot sauce looks fabulous! 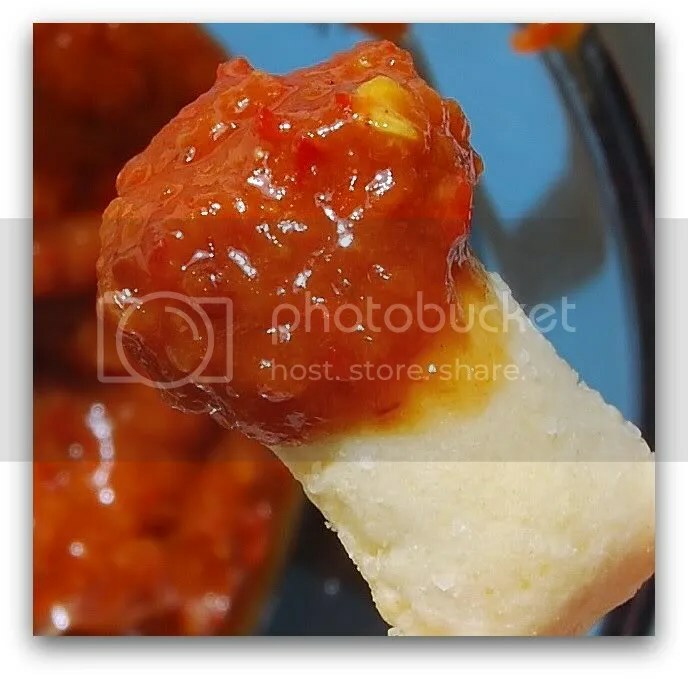 Great photography … make the sauce pop red! Sounds yum, thanks for the recipe! Thank you all for the lovely comments, and for the encouragement to blog more often! Shellyfish – I haven’t yet started any projects from the book but I have in mind a pillow that I would like to do for our living room.